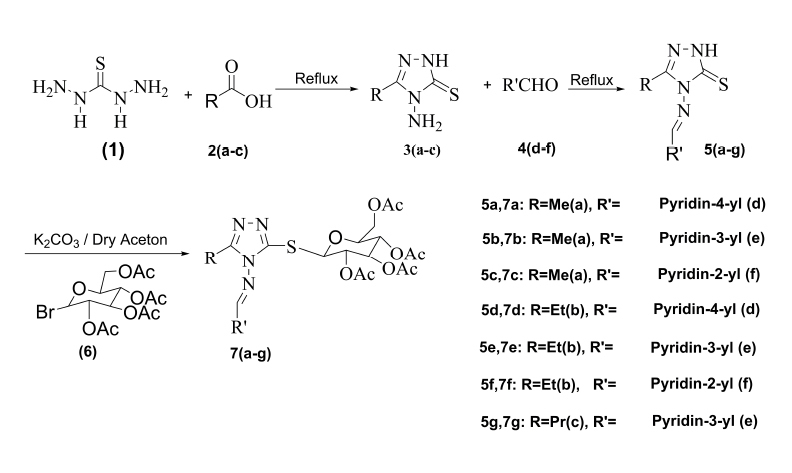 A novel series of 3-S-β-D-glucosides-4-arylideneamino-5-alkyl-1,2,4-triazoles were designed and synthesized by reaction of 4-amino-5-alkyl-4H-1,2,4triazole-3-thiol Schiff bases and 2,3,4,6-tetra-O-acetyl-α-D-glucopyranosyl bromide. The structures of the target compounds have been characterized by 1H NMR, 13C NMR, FT-IR, and Microanalyses. All the newly synthesized compounds have been screened for their in vitro antibacterial and antifungal activities against two Gram-positive bacteria [Bacillus cereus (PTCC 1015) and Staphylococcus aureus (ATCC 25923)], two Gram-negative bacteria [Pseudomonas aeruginosa (ATCC 27853) and Escherichia coli (PTCC 1399) and two fungi [Aspergillus niger (PTCC 5012) and Candida albicans (PTCC 5027)].